Q: I really like the slicked back style of Don Draper's hair. I've got a similarly dark mane, which I usually cut myself, but I'd like to try it. The wife's not so sure. How can I pull it off without looking like a Draper doppelganger? A: Defying the wife? You do take after our anti-hero, don't you? 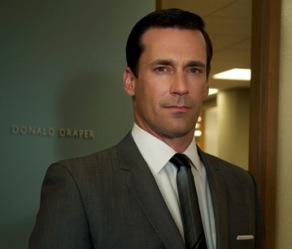 The thing about Don's slicked-back 60s 'do is that it's always expertly trimmed. So your DIY days are over. Start with a proper cut at a place like Doug's & Don's Barbershop, and once you've got the tapered sides and sharp left part, then you're ready to rake through some product. Janie Bryant, Mad Men's vintage-loving costumer designer, told us she thought the guys' heads were greased with period-appropriate Brylcreem. But the show's hairstylist has copped to simply shellacking locks with Redken gel. While that'll work onscreen, in real life, you'll want something in between the oily balms of the part and the crusty gel of your teen years. Moderation is key. You're looking for a slight gloss, not a wet head.